For most, picking a vehicle color is based on what you personally like. Here are some other considerations, if you’re trying to choose between a couple of favorites! Considering a custom color? You can have your car repainted after purchase (but not by Tesla). You can also wrap your car with a color wrap. Here’s a cool Car Color app that lets you play with custom colors, wheels and blackout trim to see how they look on a Model 3. When the car’s body completes assembly, it is moved to the primary paint shop. The car at this point is called a body-in-white. It includes the frame, doors, hood and rear hatch. The plastic bumpers and any other plastic parts are processed in a separate paint shop in the factory, as the prep is different. Coatings are applied over the aluminum or steel body-in-white to achieve the final look. The thickness shown are general industry ranges based on coating products available and are not specific to Tesla. After the vehicle is submerged in a pre-treatment bath, the entire body is submerged in an anti-corrosion electro-coating solution (e-coat). This step completely coats the entire body. For accident repairs, panels also get this anti-corrosion treatment before being sent to a body shop. A primer coat is sprayed on. This and all later layers are applied via robotic sprayers. The color paint layer is applied. This can be a solid paint or paint with metallic particles. Depending on the solids within the paint formula and how it is applied, it is usually a single thick coat robotically applied at a factory or 2 to 3 thinner coats when hand sprayed at a body shop. For Red and Pearl Multicoat, a 2nd thin effect layer is applied. This is the final layer, and protects the color coat from UV, and minor abrasions. For multi-coat red, Tesla tints the clear coat red for added visual depth. Tesla has multiple lines within the Fremont factory where vehicles are painted using robotic paint sprayers. All the metal parts for a single vehicle are processed in the same operation. The plastic parts, such as the bumpers are painted in a different shop. There seems to be a lot of mystery and outright bad information about vehicle paints and coatings. Here I’ll talk about common misconceptions and differences between factory paint and those applied by a body shop for a repair. Some of the following statements are sometimes made by unscrupulous salesmen who are trying to sell expensive overlays, coatings, or film. This might have been true 30 years ago when industries were first forced to go to a low VOC (Volatile Organic Compounds) type paints. At that time, areas like California and Europe required low-VOC paints, to reduce pollution and reduce worker harm from these toxic and often carcinogenic compounds. Even asbestos was used as a filler in paints of the 1990s! Currently many areas around the world require the use of safer low-VOC paints. Paint products over the years has gotten dramatically better, to the point where it is often preferred over the old high-VOC paints, even when not required due to regulations. Some body shops (where allowed) still hang on to the old VOC methods, as they loath to change. Today there is no advantage using older high-VOC paints, but it can be costly for a shop to convert and learn the new methods. Because of the chemicals used in high-VOC paints, there are higher risks of undesirable chemical interactions between coats or the part’s surface. It’s not a large issue, but it does occur on occasion. Automaker (insert any company here) uses only 1-2 paint layers or “thin” paint, whereas the top companies use 4-6 layers. Aside from reducing pollution and toxins, current low-VOC waterborne paint formulations use significantly more pigment in a layer. With old VOC formulations, 4-6 very thin coats were required, with a flash dry between each coat. Today’s water-based factory applied paints require one or two base layers and an optional ½ effect layer. The layers depend on the paint formulation used, how much pigment is in the paint and the equipment used to apply it. The number of layers does not affect the end quality. Fewer layers means there is less chance of contamination and dust between coats, far less staging areas and production time is significantly reduced. After drying the thickness of high-VOC vs. low-VOC paints are similar. A better question is why any automaker would use the old 4 to 6-layer labor intensive high-VOC paint system. Lots of negatives and no positives for a factory today. The top vehicle manufacturers, such as BMW, Lexus, Mercedes, Porsche and Tesla have been using low-VOC waterborne paints in production for many years now on their vehicles. 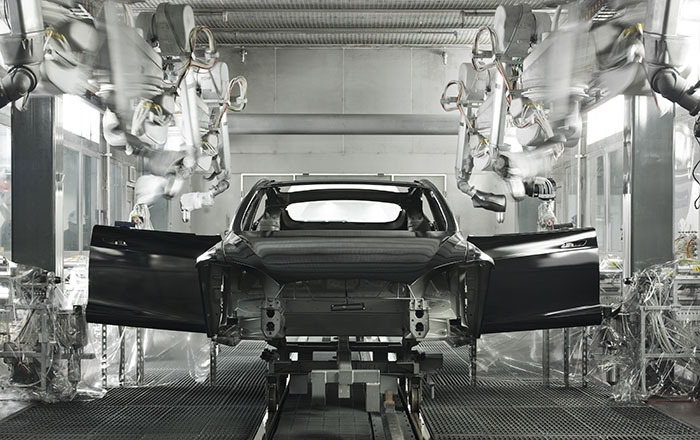 Generally, a factory like Tesla, will cure the paint and clearcoat using an oven. It is completely cured and hard when it leaves the oven and any desired wax or coatings can be safely applied soon afterwards at the factory. With body shops and related painting operations, they may not have the high-heat ovens used by factories and will need more time for the clear-coat to outgas any remaining solvents. The body shop can speed this by selecting the right clear coat formulation for the time of year and adjusting the catalyst. The clear coat typically takes 1-2 days to dry at a body shop, but there are many variables that could make it take a lot longer. Factors include temperature, humidity, clearcoat type, who’s applying the coating and more. Often 30 to 60 days is recommended by the shop before adding a film or wax coating that would trap remaining solvents. Perhaps this is overkill but better to err on the safe side. Automaker (insert any company here) paint is soft. There is a tiny bit of truth to this one, but misleading. Most owners think of the entire layers of coating as the “paint” of the car, but it is just the color layer. This color layer is soft and easily scratched. That’s why every automaker applies the hard clear-coat on top of the paint to protect it. Why is there no matt finish option? A matt finish no harder to create than a gloss finish, but it is very difficult to fix minor errors, dust, or scratches without being noticable. You can’t buff out the coat like you can with the glossy clear coat layer. In addition, on a matt surface, anywhere you touch will turn glossy from natural oils in your fingers. Areas like arround door handles can quickly look ugly. There are matt wraps you can apply to your car. We suggest you view a car with the same color/matt finish and confirm you’re willing to live with the extra effort it requires. Paint process and paint colors are different for the Tesla Roadster, where the paint was applied to carbon fiber body at the Lotus factory in Norfolk, England. Research for this article was done by TeslaTap, along with consulting several paint experts. It’s possible some vehicle factories and body shops use different processes.